FIRST, the bad news. As inconceivable as it might seem to any North East veterans of the bruising 2008/9 relegation battle, Sunderland and Newcastle have conspired to collect fewer points so far this season than they had done after 17 games back then. Lest we forget, it was a campaign which ended with four managerial changes, a club up for sale, not the slightest whiff of a Cup run and the two teams occupying two of the bottom four places in the Premier League. For those of you with short memories (or those of you who have chosen to expunge it from your memory banks), it was unremittingly bleak. Yet Newcastle are two points shy of their 2008/9 pre-Christmas tally (and lower in the table), while Sunderland – though higher in the league – are also running two fewer than their total back then. For those of us who believed Alan Pardew and Martin O’Neill had ushered in an era when relegation worries were swept to one side in favour of North East dreaming, it is a jarring wake-up call. We must hope the same uncompromising message is rebounding around the respective dressing rooms too, for on current form both will be sucked into the battle at bottom before the end of the season. 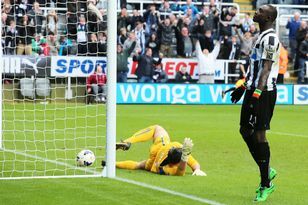 It felt like it was heeded by Newcastle at least on Saturday, when they turned in a defiant second-half display full of brio that warranted reward against Manchester City. If they play like that consistently in the second half of the season, talk of relegation will sound frankly ridiculous come May. However, this weekend, in particular, will be critical. Newcastle welcome a QPR side which, while improving under Harry Redknapp, simply have to be dispatched at St James’ Park while Sunderland travel to Southampton in a game they dare not lose. A pair of defeats and suddenly the mood will shift dramatically. Despite those unflattering comparisons with the 2008/9 season, though, there should be greater confidence in the North East our big two will be able to extricate themselves from trouble before long. Form and results might not support that assertion, but both teams are benefiting from a stability which was notable by its absence four years ago. The first signs of Roy Keane’s revolution unravelling were noticeable in the early days of autumn but not until December did the menacing air around the Stadium of Light turn toxic. By the time Keane went, Sunderland were 18th and fully embroiled in a battle at the bottom. He was replaced by the unconvincing Ricky Sbragia, a good man and excellent coach but patently uncomfortable in the manager’s seat. We sniffed trouble on the horizon, and so it proved. This time around, there is Martin O’Neill. Everyone knows where they are with the Ulsterman, not least the North East media after Ellis Short’s strident tour of the Stadium of Light press room last week. He is here to stay and that is worth its weight in gold. Similarly at Newcastle, there is an air of permanence about Alan Pardew. There have been mistakes made this year and the run they are on is deeply wounding to the pride of the manager but the pressure is not building and the performances are far from desperate. Four years ago, the Magpies had already lost Kevin Keegan and were in the midst of Hurricane Kinnear, which blustered but ultimately blew itself out after encouraging initial results. Always billed as an interim manager, we were never sure how seriously to take him and the feeling transmitted itself to players, supporters and the opposition. Add that to the rebellion which was in full swing on the terraces and you have a club set on the course to catastrophe. When the seriousness of the situation was finally grasped by all involved, it was too late for the club to galvanised – even by the extraordinary appointment of a legend like Alan Shearer. None of this means we should not be concerned. Demba Ba’s unhelpful comments in a French TV interview – which receive due prominence in today’s Journal – are indicative of the sort of thing which wouldn’t have happened last season. It is worrying United’s most effective player is even quoted talking about his January transfer window intentions. Last year the team were a band of brothers and played like it. They were lean, mean and effective and the team need to reclaim that sense of purpose and defiance, that air of arrogance and confidence which spurred them on to fifth place. Three or four new additions – and in 08/09 Newcastle got two, while losing their goalkeeper – would shock the complacency out of a few players and prove to the rest of the squad United aren’t happy treading water. It is essential Mike Ashley heeds the warnings of the past and invests. Over the river, measures need to be taken in January too. Sunderland are crying out for a midfielder with creativity and strength to add balance to their engine room. Add in two full-backs and the Black Cats’ work is cut out for them once again in the New Year. This doesn’t have the feel of a North East relegation season just yet, but complacency is the enemy in situations like this. Until the two teams rediscover the values which propelled them last year, the shadow of 2008/9 will continue to grow longer. A DELIGHTED Martin O’Neill last night saw his Sunderland side move to within a point of neighbours Newcastle United after an impressive win over Reading.